After over a week of eating canned soup due to the winter bug, I am ready for some freshly cooked food. Something simple and quick, actually. So, for one of those “I don’t know what to make for dinner” moments, this is a no-brainer, really. Grill or bake a chicken breast and top with gravy! How easy is that? And the gravy is wonderful. Try it! And like I said before… brine the chicken ahead of time, if you can. It makes a whole lot of difference in taste and texture. You will be glad you did. Season the chicken breasts and cook it your way, baked or grilled. 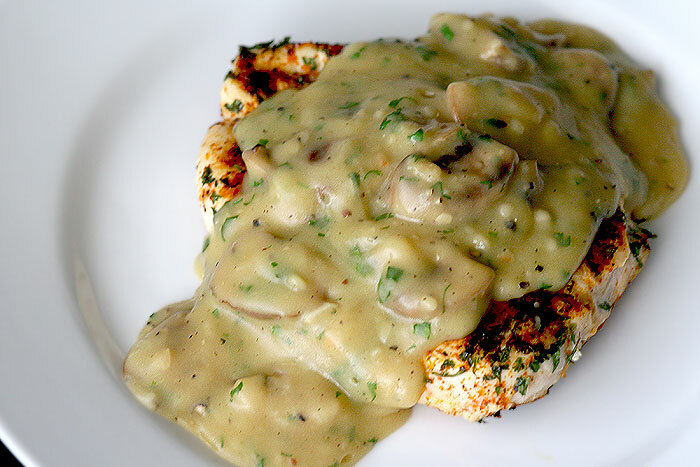 To make the gravy, heat butter in saucepan (in medium heat) and cook mushrooms until dry and browning, 8 minutes. Add flour and cook for another 5 minutes or so. Whisk in the stock until fully incorporated and bubbly. If it’s too thick, just add more stock. Reduce heat to low and let simmer for about 10 minutes, stirring often. Add herbs and salt & pepper to taste. Serve chicken breast on a plate. Pour gravy on top and garnish with more herbs. Seems like I’m on a French cooking streak here, lately. Blame it on PBS! I was watching an episode of Avec Eric last weekend and was inspired by the chicken paillard Chef Ripert was preparing. However, I have been eating chicken for almost two weeks straight now and didn’t want anymore, at the moment. So, I thought of using a portobello mushroom instead. Well, it’s flat enough, I thought. As you may know, paillard is usually a piece of thinly sliced or pounded meat (usually a chicken breast, veal or beef) that is cooked quickly in high heat and topped with some kind of salad or whatever. But this time, I didn’t want to use meat as a base. The portobello turned out to be fantastic, though. And with the Mediterranean flavors as a topping, I am definitely happy with my choice of ingredients. By the way, the amount of my ingredients are all approximated. Feel free to switch things around, or even create your own flavors. I just happened to like this combination. Boil raisins in white wine, drain and pat dry. 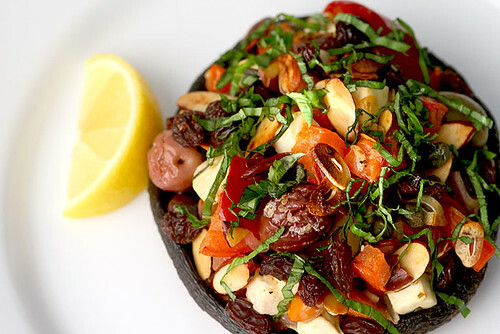 In a mixing bowl, combine shallot, garlic, tomato, capers, raisins, olives, roasted bell peppers, goat cheese, nuts, a grind of pepper and a drizzle of olive oil. Coat mushroom cap lightly with olive oil and lay upside down, on a baking pan. Top with salad mixture and drizzle with a little more olive oil. Bake in 450F oven for about 15-20 minutes. Transfer to a plate, top with chopped basil and squeeze lemon juice. Garnish with a lemon wedge.